The Anniversary Speed Graphic was manufactured 1940-47 usually black leather. (Previous reports about military versions in olive drab are unsubstantiated.) The lens standards are generally all-black. The back is stationary (horizontal) and either of the "Graphic'' type (a spring back which accepts standard modern 4x5 film holders, but not the later roll-film backs) or a "Graflex'' back, which takes the same film holders as the Graflex SLR cameras. These film holders are no longer manufactured. The Anniversary has a body-mounted shutter release for the rear focal plane shutter, but no such aid for the front shutter. The lens standard offers front rise and shift, and a drop bed, but no tilts or swings. Lensboards for Anniversary (and pre-Anniversary) are Graphic "C" boards, which are 4x4 inches. There are adaptors to fit the Pacemaker metal boards on the older cameras and they show up occasionally at camera sales. The wooden boards are fairly easy to get or make. The Graphic will also take 4x4 metal lens boards made for the Graphic View but will not take the Calumet boards, although the Calumet camera will take everything. INTERCHANGEABLE LENSES -- A large removable lensboard and long bellows permit interchangeable use of a wide selection of speed, wide angle, and telephoto lenses. BROAD EXPOSURE RANGE -- The focal plane shutter in combination with a between-the-lens shutter afford controlled exposures ranging from one full second to 1/1000. VIEW FINDERS -- The folding wire frame finder is concvenient for following fast action. The tubular optical finder supplied on the three smaller sizes is idea for all-around photography, giving a clear, unobstructed view of hte picture; its parallax adjustment makes for accuracy in shooting at various distances. GROUND GLASS FOCUSING -- Those accustomed to bgground glasss focusing will enjo using the Speed Graphic's ground glass focusing panel. This panel is built on those cameras supplied with the "Graphic Back" which accepts Graphic holders and the Kodak film pack adapter [obsolete]. 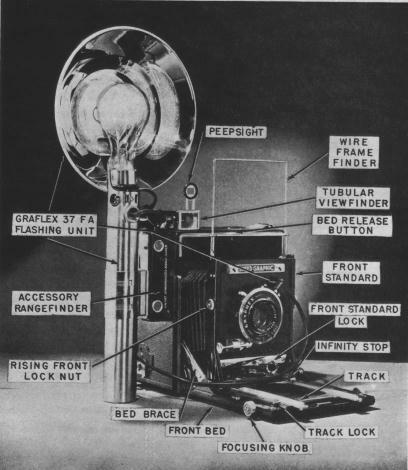 Cameras supplied with "Graflex Back" use the accessory Graflex Focusing Panel interchangeably with all Graflex film and plate accessories. COUPLED RANGE FINDERS -- The coupled range finder, a popiular accessory, rounds out the Speed Graphic as the only all-purpose candid camera. PHOTOFLASH SYNCHRONIZATION -- With a synchronizer-equipped Speed Graphic, you can start your picture-shooting when the sun goes down. There was no 2-1/4 x 3-1/4 Anniversary Graphic. The Miniature Speed Graphic, a pre-Anniversary model introduced just before the Anniversary models, continued in production. Picture size: 3-1/4" x 4-1/4"
Focal Plane Shutter: 24 speeds up to 1/1000 and "time." Built in focal plane shutter flash synchronization. Available with either "Graphic Back" or "Graflex Back"
Sheet film in this size is no longer made. You can cut it down from 4x5, or buy it already cut. There are rumors of Graflex Back roll-film adapters, but sightings are rare. A 3x4" Speed Graphic with a Graphic back or an Anniversary Back is probably best enjoyed as a collectable camera, and not a user camera. It is a pity, since the size is quite handy. Picture size: 4" x 5"
Focal plane shutter: 24 speeds up to 1/1000 and "time." Available with either "Graphic Back" or "Graflex Back." Focal plane shutter: 24 speeds up to t1/1000 and "time." 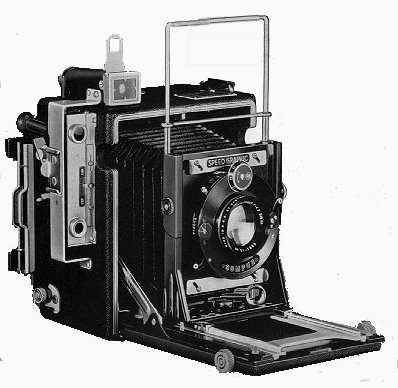 The 5x7 Speed Graphic, when supplied with "Graphic Back," accepts Century Riteway film holders and the Kodak film pack adapter [obsolete]; with "Graflex Back" it regularly accepts Graflex film and plate accessories. Shown here is an Anniversary Speed Graphic with an early Kalart Rangefinder. The lens is in a dial-set Compur shutter.